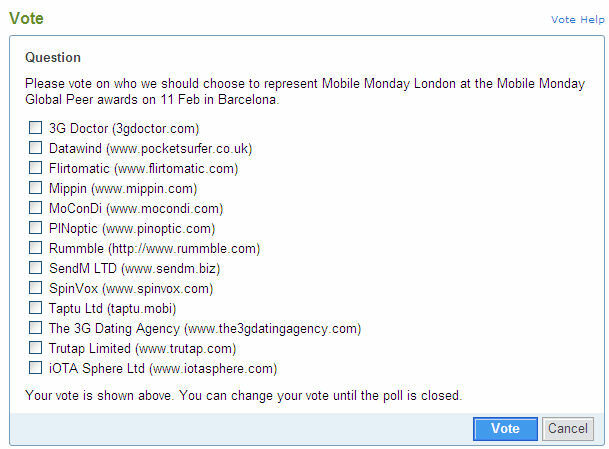 Mobile Monday London team has prepared with transparency the vote for electing the company to represent UK mobile companies in the coming Mobile Monday Peer Awards at the Mobile World Congress in Barcelona. The event concept in Barcelona and selection is easy: every MobileMonday chapter is invited to nominate one startup to the Peer Awards Barcelona 2008. This year, we’ll divide the start-up finalist presentations in two categories: early-stage start-ups (founded in 2007, early-stage financing) and emerging start-ups (founded in 2005 and after, inbetween Series A & B funding). The organizing committee and jury selects the finalists to present at the awards event. In the meantime, Mobile Monday London is using it Yahoo! Groups platform to permit to their members to vote for the best. – 3G Doctor: The 3G Doctor service is organized by a committed team of professionals who have a wide range of healthcare experiences and expertise. – Datawind: Based in Montreal, Canada, DataWind is a leading developer of wireless web access products and services. DataWind has developed and offers a series of wireless web access devices and the related web delivery platform. Our products are offered by the world’s largest and most prestigious Cellular distributors. – Mippin: Mippin delivers the latest news, blogs and other web content in the perfect format for your phone – giving you the control to discover and share what you want. – PINoptic: PINoptic is an innovative authentication solution that can easily be adapted and integrated into a multitude of security applications. PINoptic specialises in Visual Probabilistic One Time Password Solutions – Authentication security using symbols, pictures and images. – Rummble: Rather than find out EVERYTHING that’s nearby, Rummble tells you what’s nearby you’ll actually like! If you choose, Rummble can also tell your friends where you, who’s nearby and where you’ll be going in the future, so you can plan to hook up. Add in best of breed social networking functionality like news feeds, status updates, drag and drop photo gallery & blogs; it’s one of the best ways to share the good things in your life with your friends. – SendM: Sendm enables people not only to send a message to many but also for the recipients to see each other and to easily communicate and coordinate outings or business meetings – combining the functionality of email with the ease-of-use and billing mechanism of regular SMS. – Spinvox: SpinVox is a service that can be accessed from any phone. Speak Freely and SpinVox will convert your words into text and send them wherever you decide: mobile, inbox, TV screen, blog and more. I love their homepage! – Taptu: Taptu is a new search engine for your mobile phone, starting with music and fact-finding. – The 3G Dating Agency: The 3G Dating Agency is a great way to find new friends or partners for fun, dating and long term relationships. Socialising with other members of the service is made possible using 3G Video Mobiles and this technology enables us to deliver this with unrivalled levels of safety, convenience and ease of use, hence our very literal name! everywhere you go… on your phone!! – IotaSphere: iOTA Sphere provides a unique technology for deploying and managing mobile services quickly while providing an enhanced standardized user experience across all services. By deploying services faster, operators and service providers can be the first to market new services to their subscribers, and benefit from immediate return on investment. The London Mobile Monday community is definitely an example to follow, whatever if I repeat myself… The Monday meetings are rich, intensive, people are listening to the companies presenting their project, companies have the time to explain their products, their vision, their market. It’s not only a networking place, just to hear quick news and drive slowly to some pizzas and glasses of wine. It’s really the event from the mobile industry, dedicated to the mobile industry, representing the mobile industry, made by the mobile industry. Innovation, pragmatism and benchmarking are 3 key words to describe the events organised. Between the events, the Momoers are sharing their views, questionning, discussing through the Yahoo! Groups platform… Always something happening there, good example of London being as the bigger place in Europe for mobile.